News of Robert Mugabe’s removal comes as MailOnline exclusively revealed that the elderly dictator had gone on hunger strike. One of his close family members confirmed that he was refusing to eat as a strategic ploy. 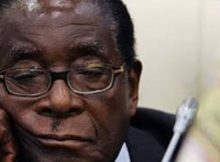 This is coming s after Zimbabwe’s ruling party sacked President Robert Mugabe and appointed ex-vice-president Emmerson Mnangagwa as its new leader.